Boční kryty dveří (větrací otvory) z leštěného hliníku pár. Je mnoho příslušenství na klasickou značku Volkswagen. Další praktický doplněk, který je upnutý v drážce dveří a bez problémů jde zavířít okno. Jsou velmi dobře zkonstruovány a pokud při parkování necháte v letních měsících otevřené okno v úrovni krytu, poskytují ochranu proti krádeži - poznámka výrobce (ale jsme v Česku). Kryty jsou vyrobeny z leštěného hliníku s kovovými mřížkami a jsou pochromované. Kryty nejsou univerzální a vztahují se na model, který je níže uveden. Side window vents polished aluminum pair. Side window ventilation grilles, it is amazing how many accessories there have ever been to our classic Volkswagen and still there diving accessories on most Volkswagen enthusiasts were unaware of the existence. So it is with these side window ventilation grilles many already think this is a modern version of the Vintage Safety Vent, but this is not true, the Vintage Safety Vent is precisely derived from this primal accessory. 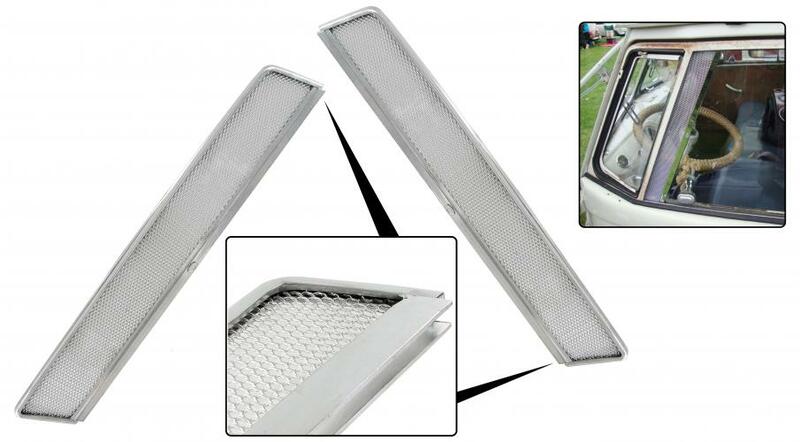 The major difference between these side window grilles and Vintage Safety Vent is the break sensitivity. The side window grilles are clamped in the groove of the door and by tightening or close sliding side window is all too well sealed where thieves also get a chance to come in, while it will make at the Vintage Safety Vent the burglar just easier . Everyone knows that when the car in the sun has been the indoor temperature can rise, unless you are in possession of these side window grilles which provide natural ventilation very high. The grids are not universal but only applicable to those listed below VW models and years. For Spijl Bus this is the only way for the Beetle, you can also apply the Vintage Safety Vent which is a lot cheaper but offer no protection against theft. Made from polished aluminum with chromed metal gratings. Plastová bezpečnostní mřížka okna dveří slonová kost levo/pravá 1ks.